Due to the high demand in people wanting to hire out a beach hut, we are setting up a beach hut share scheme based in Felixstowe, Suffolk. It is important to get your beach hut ready for the new season. We can arrange for beach hut repairs and maintenance, as well as supplying new beach huts. We are able to arrange quotes for the supply and installation of new beach huts, including the removal and disposal of existing beach huts. The Wendy house benefits from a convenient location, just a few huts along from Hove Lagoon's facilities; toilets, cafe, playground etc. The hut is equipped with all you would need for a family day at the beach: chairs, loungers, BBQ, crockery etc with a small gas stove. There is a drinking water tap very nearby. To locate the beach hut, walk down towards the sea with the lagoon cafe on your right. Turn right and the hut is a few huts a long. 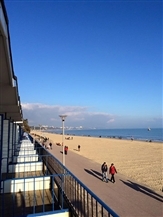 This is a Brick-built, well equipped beach hut and with all essential requirements, located at a top location on the promenade. It has direct beach access and is adjacent to a shower and tap. There are fantastic coastal views to Hengistbury Head and The Old Harry Rocks. The Canford Cliffs Chine Beach is of the finest quality with fine golden sand and clean, safe water. This is a beach hut used year on year by regular hirers. Excellent location immaculate condition fully fitted. This beach hut is located at Brackenbury Cliffs / Fort off Golf Road near the toilets, car park and water supply. Note you can park you car directly behind the beach hut so no long walks from distant car parks loaded up with items. The beach hut benefits from lovely grassed area's front and rear with a hard stand at the front for tables and chairs. No inconvenience of people continually walking past. A beautiful, recently modernised beach hut in Poole close to Sandbanks. The beach hut is on the upper floor which allows for more privacy. Amazing views out to Old Harry Rocks and over to Bournemouth and the Isle of Wight. Colourful beach huts are available for weekly hire overlooking the stunning, award winning beach at Lowestoft. We have 25 huts available for weekly hire, with special offers on block bookings throughout the season. Our brand NEW Southwold Beach Hut was built in 2014. It is family owned & has traditional blue & white beach décor. It’s very clean, modern & just adorable. It is next door but one to the Pier on the North Beach. It has a perfect position overlooking Southwold beach with beautiful sea views, a gorgeous sandy seashore, a minutes walk to the famous Southwold Pier, 30 seconds walk to the large Car Park & 30 seconds walk to the toilets. This site has been designed to put beach hut owners who are selling their beach hut or renting their beach hut in contact with those who would like to buy a beach hut or hire a beach hut or to provide a means for beach lovers to find a beach hut to buy or rent, either when visiting a resort or as a retreat closer to home. We hope you find the site useful and if you have any comments please contact us via the link above. It is free to advertise your beach hut for sale or hire, just register your beach hut with us by clicking the relevant links at the top of the page and on the right hand side.